@Hawaiibadboy You got Solaris and had a review before. This is going to be so direct but i am just wondering how well S8freedom is against Solaris. Your opinion is quite important to me. He said in one of his livestreams (trying to find it in there would be a nightmare because they're not short!!) that he thinks it absolutely beats the Andromeda in terms of enjoyability and resolution. Researcher and warriorpoet like this. I already went though some pushback for saying I thought the S8F was a more resolving and enjoyable set. I made the mistake of using dumb hype phrases like "not even close" etc. I hate that talk so I apologized for doing what i hate but my opinion is still that. One of those sets that will hold up over time. S8F is excellent and relative to Solaris and U.M. Mentor V2....a great price. I want to send them back and get a re-shell and custom caps. Sitting on my money until I hear your impressions of the Pro, but what do you think about using the Freedoms for live monitor use? If the graph of the PRO is accurate it may be better balanced and realism would follow too since the live being monitored is the "real" for you. Already mastered LP's sound as real/enjoyable as I have found but live monitoring I imagine needs a little more neutrality. perfecious and jsmiller58 like this. Can someone post or link to the graph for the S8Pro? The only one I've found was exactly the same as the S8F. 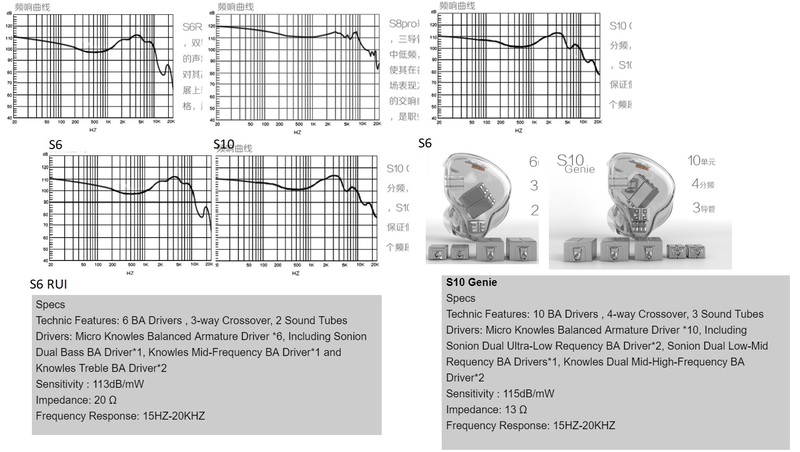 I'm comparing the FR and layout of these and it's hard to tell, but the S6 and S10 seem to be competing to see which Harman Target Curve is closer to reality. The only major difference is the drop from 5-7k on the S10 and a slower drop and earlier peak before 20k on the S10. I suspect the S10 should sound slightly airier given that and the 4way x-over. The S10 has 3 sound tubes and a 4 way crossover..... Versus 2 and 3 on the 6. I there in the FR graph of the S8 for fun, not my cup of tea, too warm. warriorpoet and SBranson like this. Thank you! I'm feeling reassured with my choice of the S8F. No, they don't - these are the exact same graphs but rearranged - s8 pro in top middle and to its right and below it is the s10. It's the s8f and s8pro that have been duplicated in the sellers' descriptions. Hopefully, the s8pro is closer to that graph as apparently the s8f isn't. You're right. My bad, I mis-read the graph. AFAIK there is no customisation like getting ear expression to shape the shell. Customisation is restricted only to shell colours and logo. No choice at all on AliExpress, or i am really blind. The instructions are being made now and will be up tomorrow I imagine. yeah .. i cleaned my mind , i will wait for bggar review of the ACME8 , maybe it isnt worth the extra cash compared to S8F.